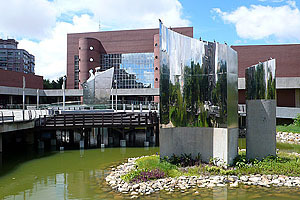 The Tainan Municipal Culture Center is the city’s premier performing arts venue. Located on Tainan’s east side, The Tainan Municipal Culture Center is probably the first place you should look if you’re searching for a little higher brow entertainment. It’s Performance Hall hosts a wealth of musical, dance and other cultural performances. Many professional troupes from Taiwan and all over the world land in this venue if they’re making a Tainan a stop on their tour. And, surprisingly, many performances that tour outside of Taipei do make a stop in Tainan. In fact, many performances come here instead of going to Kaohsiung. The quality if the Tainan Municipal Culture Center Performance Hall and the reputation of Tainan as a cultural magnet are most likely the reasons why. The promanade spans a large pond. The Tainan Municipal Culture Center was built in 1984 as a prized work of architecture for the city. Its pond-graced promenade was seen as a modern take on traditional Chinese gardens. Its use of brick was reminiscent of traditional building practices in Taiwan. Fountains, foliage, and sculptures surround the grounds, and winding bridges make up the promenade that leads to the different buildings. The center is divided into three different sections. The most obvious is the Performing Hall which is in the center. The Cultural Artifacts Exhibition Hall is on the left, and the International Conference Hall is on the right. The Performance Hall is not only the central building, it is the central focus of the culture center. Its world class, fan-shaped theater seats 2010 people, and there really isn’t a bad seat in the house. The balcony has excellent views and offers some real value if you’re close to the front of it. A wide variety of traditional and modern art performances grace this theater. New York dance teams, Cuban jazz performers, international orchestras, Japanese flying ship theater, Irish tap theater, drummers, violinists, and many others all make stops here from time to time. It is even the venue of popular performances like Cats and River Dance. It is quite surprising the level of international talent that makes its way through little old Tainan. The other facilities in the center go more under the radar. The Cultural Artifacts Exhibition Hall is more dedicated to the visual arts. They have a permanent collection in their main hall with three additional rotating galleries. It mostly focuses on local artists and the promotion of art throughout the community. There’s also the well-equipped International Conference Hall that seats 129, and a large Music Library that houses many media labs, a children’s reading room, and a large music and book collection available to the public. The Tainan Municipal Culture Center is in a good location amongst a modern neighborhood. While there is a cafe on site, there’s also a multitude of restaurants surrounding the building and a small shopping mall next door with a Starbucks and a Subway. To extend the greenery of the center, Barclay Memorial Park is right across the street. Events are a little hard to track if you don’t read and speak Chinese. You can try this Chinese-only website for information and ticketing, or you can keep your eyes open for street banners and posters. 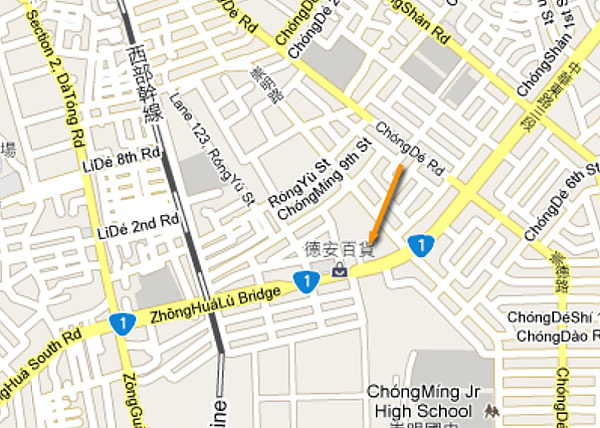 If anyone knows more about how to stay informed of events coming through Tainan, please feel free to leave a comment. When visiting my in laws in Taiwan, I live nearly opposite the centre. I regularly go and see some performances they hold in the open air theatre at weekends. It is not always good quality but sometimes it can be quite good. They also sometimes have small pop concerts of bands from the area in front of the building. It is usually not very good but not bad either. Thanks for info Arnaud. I don’t pass by there much myself, so I didn’t know of this. I would like to start attending dance lessons. I am particularly interested in Ballet lessons, but also other forms of dance. I am living in Tainan. Please send me details of anybody I could contact. It is not possible to understand, that around all Tainan center are hundred meters long tables of entertainment, closed the main streets, rituals and firecrackers ….. And nobody knew what was celebrated …. So is very hard for me, as a foreigner, write something seriously about it of course! There are dozens and dozens of religious parades and events in Tainan each year. Quite often they are specific to a temple or deity, and unless someone is very involved in that particular temple, it is unlikely they will know anything about it. Taiwan’s religious culture is extremely diverse and complicated and the educated class is getting increasingly secular. I also used to get frustrated that I couldn’t get more information on religious activities from educated Taiwanese friends. You’ll either have to seek out people who are really informed about a wide variety of religious activities, or just accept that it’s not going to be that easy to get simple answers on a very complex subject.